The Swinging Sixties Show is a superb example of the perfect nostalgia trip. The past becomes the present, your feet tap to the rhythm of your youth and young love lives all night long... It’s a two-hour spectacular filled with non-stop entertainment and fun capturing the sounds and mood of music’s most exciting era. Audiences can look forward to a very high level of musicianship and punchy professional performances, which consistently deliver faithful renditions of classic songs. Covered are artists such as The Beatles, The Rolling Stones, The Kinks, The Monkees and The Easybeats, as well as legendary divas Cilla Black, Dusty Springfield and Lulu. Bobby Benton and Twiggy Skylark share the vocal duties on stage, covering all the key hits of the day with skilled finesse. The band members are passionate about the Sixties; no detail is left to chance. Tailormade sixties’ style mod suits and dresses, Rickenbacker and Gretsch guitars, Vox amplifiers... They’re all part of an authentic entertainment experience that will leave the audience cheering for more. To top it off, the show features the gorgeous Sixties A Go Go Girls, shaking their tail feathers in authentic dance routines, with multiple dazzling costume changes throughout the show. The Swinging Sixties Show always delivers a high-class, top-end stage show, which has filled venues around the city for over three decades. You really can’t argue with that sort of pedigree! The Swinging Sixties concept was conceived back in 1987. Rather than just looking and sounding like a 60's band, why not recreate all the atmosphere, fun and hysteria that was the 60's, popular music's greatest decade, and take an audience to an incredible high and leave them there! The band was extremely busy over it's first decade, with many residencies in and around the Sydney pub and club circuit, including an 8 year continuous Sunday residency at the iconic Woolloomooloo Bay Hotel, as well as being in demand for numerous corporate and private engagements. Continuously playing for the past 3 decades, The Swinging Sixties have built a very strong reputation for their ability to engage their audience like no other group of its kind. Their latest production, The Swinging Sixties Show takes this audience participation to yet another level. This highly entertaining non-stop 2 hour auditorium spectacular features around 40 hits from music's most exciting era, with 12 fully choreographed dance numbers featuring the gorgeous Sixties A Go Go Girls. The Swinging Sixties Show is a fun-filled night offering a great time for everyone! "Hi. I have seen the band twice at Canterbury Leagues and loved it. For all the latest 'Sixties News' and recent images and videos please visit our Facebook Page. over 70 numbers and it is ever growing. Here is a sample. Over 30 years The Swinging Sixties have built a very strong reputation for their ability to engage their audience like no other group of its kind. The Swinging Sixties Show takes this audience participation to yet another level. This highly entertaining non-stop 2 hour auditorium spectacular features around 40 hits from music's most exciting era, with 12 fully choreographed dance numbers featuring the gorgeous Sixties A Go Go Girls. The Swinging Sixties Show is a fun-filled night offering a great time for everyone! Recently The Swinging Sixties was selected for a 17 gig run with Cumberland Newspaper Business Awards Functions. Over the past 25 years the band have also played at many major corporate events, private birthday parties, clubs, pubs, etc as the music appeals to all ages. 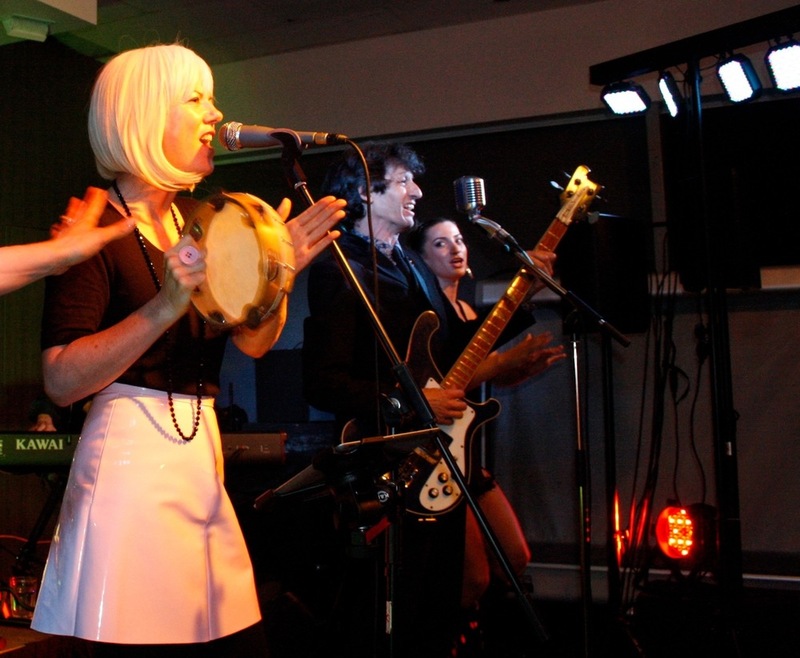 If you are looking to make your next function a 100% guaranteed success you have found your band! Pass on my thanks to the Swinging Sixties,They were great on the night. With raffles leading up to & on the night the event made a profit of $32,000 to buy equipment for the Kids from the Sydney Children's Hospital at Randwick. Ah, the '60s... the era of the Beatles-led British beat group invasion of America, Martin dreaming, Woodstock screaming, stove pipes, miniskirts and beehives, and men on the moon. The Beatles, Rolling Stones and Dusty ruled the day, and these moments were captured in all their grainy glory on 8mm film. The '60s have given us some of the most important cultural moments of our lives, and now its most singable tunes have inspired a unique Australian show! 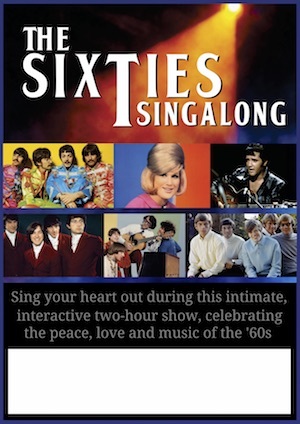 Whether you want to relive your youth or wish you'd been old enough to witness the hysteria that was Beatlemania or go to Woodstock, The Sixties Singalong will add joy to your day. Come along in '60s-style fancy dress (we know you've still got that cute mod babydoll dress in your closet...) and sing your heart out! Just in case you've forgotten the lyrics: they'll be reflected on a big screen next to Bobby and his guitar on stage. Don't fret about being called out to perform on your own. This is not karaoke, but rather a singalong led by one of Australia’s leading '60s music experts. Bobby spices things up with loads of informative and interesting trivia about your favourite artists, so you'll learn something new, too! To book this all new show please contact Nancy at All Things Entertainment. © 2019 The Swinging Sixties. All rights reserved.